The lecture was co-sponsored by the India Community Center, Bay Area, The Center for South Asia Stanford University, The Asia Foundation & World Affairs Council of Northern California. Economic foreign policy– focused on investment, not aid as it was a couple of decades ago. Trade with the US has become about 35% of India GDP. Energy– India imports 70% of its oil, mostly from the Middle East; exploring common ways to to reduce this reliance, look at alternative solutions, and negotiate on climate change policy. Security of the Indian Ocean– partly due to this high level of energy imports which is transported using the seas; security and naval presence in the waterways surrounding India is critically important to India. Global partnership since end of Cold War- since the end of the cold war, the US has emerged as India’s most important external friend, a relationship that India is looking to cultivate for larger global issues. International Finance Reform– the global financial meltdown has proved how the financial systems in the US are intertwined with the world’s financial exchanges – India and the US US are both motivated to affect these reforms through a better partnership. Trade– Expand the trade dialogue from India-US to full regional and global policy. Climate Change- With the arrival of the Obama administration, the US now has a government that is inclined to do something about climate change and will be open to compromise and negotiate. Nuclear Proliferation- a big priority for Obama; India believes it should be part of the exempt NPT group. More dialogue will continue and opportunities to drive global positions on nuclear positions of countries like Iran will present themselves. US– Burden of History– US is accustomed to partnering with militarily strong partners (stronger than India) and has considered countries with not as strong of a military to be a junior partner. India’s Concept of Sovereign Autonomy– Given its history, the Indian government does not want it to look like the US or any country is driving its foreign policy. Ability to create a Strategy—Shaffer suggests that India’s and the US government do have a harder time in building a strategy— it’s a massive effort to create a systemic strategy across all layers of government as well as the rest of the public and private sector. It’s easier to be tactical than strategic. 4. 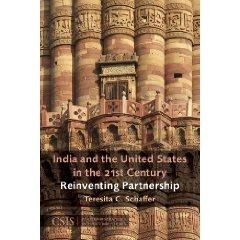 Finally, Shaffer suggests NRIs in the US can help explain aspects of American thinking and systems to the Indian government and people, who often assume they fully understand the American system, but may not fully comprehend all of the nuances which could result in misunderstandings and impediments to building a stronger strategic relationship between the two countries. Interesting points! Item 3 about the hurdles to build Strategic partnership is the reality! But at the same time, change in the mindset for both sides might have a tremendous gloabal impact! Let’s hope there is a progress! This statement is factually incorrect: “Trade with the US has become about 35% of India GDP. According to the Hindu Business Line, total Indo-US trade was $42 billion in 2007-2008 when India’s GDP touched $1 trillion+. I’ll have to check that stat further…Schaffer cited that metric during her speech, but she also mentioned that many of the statistics don’t count IT services in their metrics and only trade of goods, so that may be the reason for the difference. yes good partnership is required.